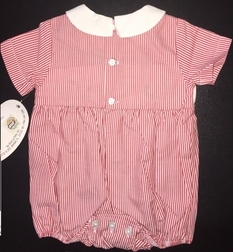 A sweet, sweet, sweet red stripe bubble for baby boys by Vive La Fete! 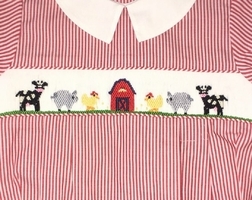 It is chest smocked with hand embroidery of cows, pigs, chickens and of course their red barn complete with hay in the loft. Don't think the cows or pigs can get up there though! 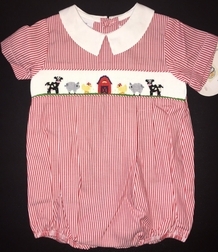 The bubble is completed with a white pointed Peter Pan collar and snaps in the crotch.